Release planning is the third layer of Agile Planning Onion. 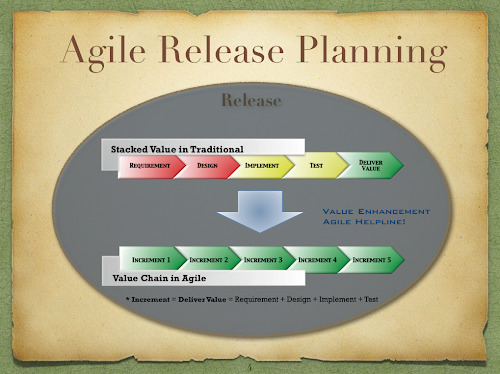 Releases represent the large-grained delivery cycle in agile development. Releases typically range between one and six months, but may extend longer in some environments. Key for agile release planning is to continuously add value in small increments to utilize feedback from internal and external customers. Following diagram depicts how traditional execution differs from agile execution. In traditional execution, value is stacked and only delivered in the end. On the contrary, agile execution creates continuous value chains driven by agile portfolio management. Releases begin with a release planning meeting where product owners (or product managers, project leads, etc.) work to define and prioritize a candidate set of features that are then estimated by the team. You can review the next planning layer by clicking on the following diagram. I recommend to watch this video to get a better understanding of linkage between all layers.